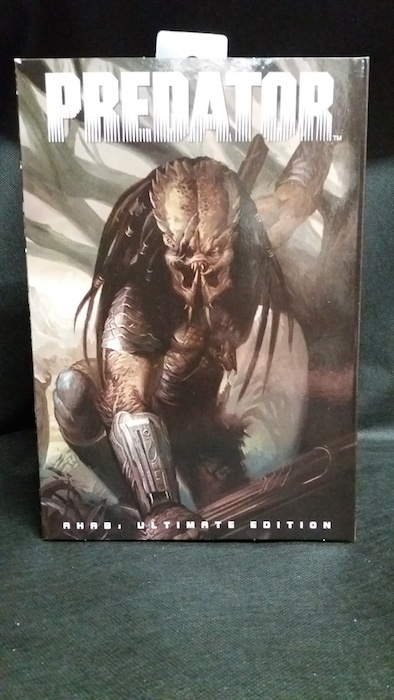 Ahab Predator appears in the Alien vs Predator: Blood & Stone and Aliens vs Predator: Life & Death and other associated comics by Dark Horse comics. 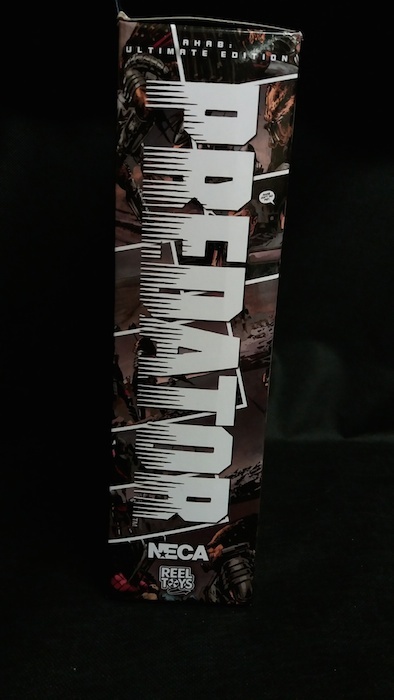 A few years ago NECA released Ahab Predator as an SDCC exclusive. Then earlier this year NECA teased that Ahab would be getting the ultimate treatment with a host of new accessories and articulation. I was really hyped for this figure and I have to say it doesn’t disappoint. Ahab comes in your standard window box ultimate packing. 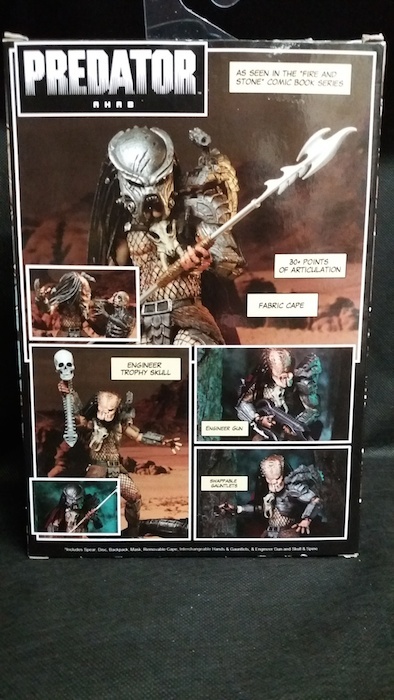 His box is adorned with artwork from the comics with photos of the figure on the back and inside the flip. The window displays the figure and all his accessories inside very clearly. There were only a few twisty ties and clear elastic holding it in place. I had no issue getting Ahab out of the packaging. 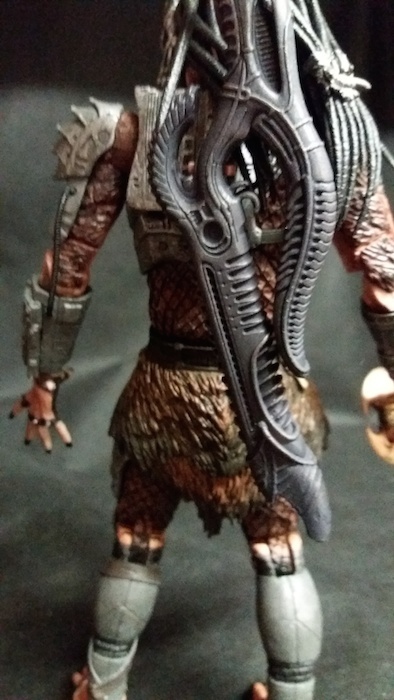 NECA never fail to impress when it comes to the sculpts of their Predator figures and Ahab is no exception. The sculpt on this figure is incredible. 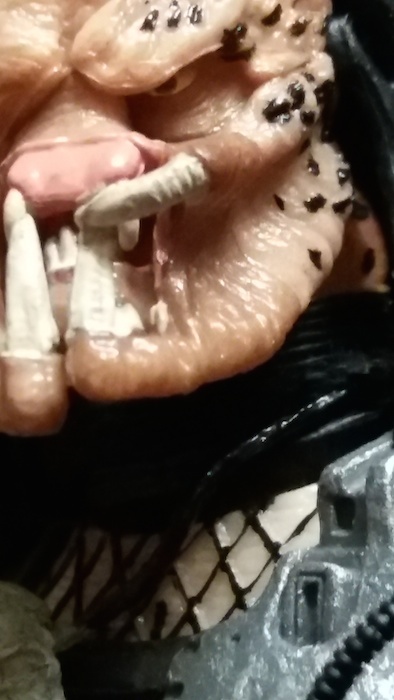 All the intricate little details that you would find on a Predator are here. His armor is similar to that of the Jungle Hunter but with a few differences to make it his own. I loved the aged look to the various pieces of armor which are covered in pockmarks and scratches. 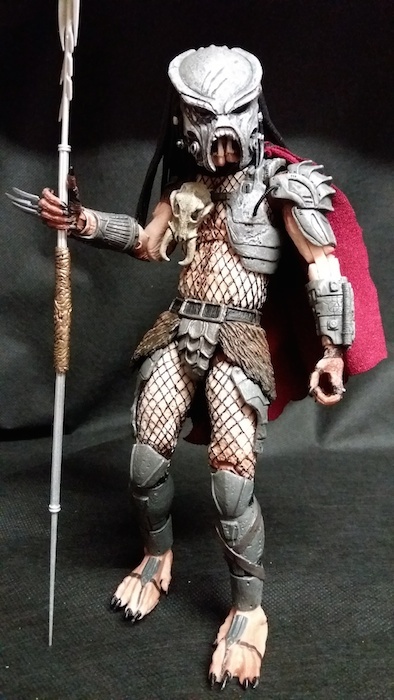 The detailing on his pelt is fantastic as well. His armor and scarred head certainly would make him stand out on the display. I can’t fault the sculpt at all. 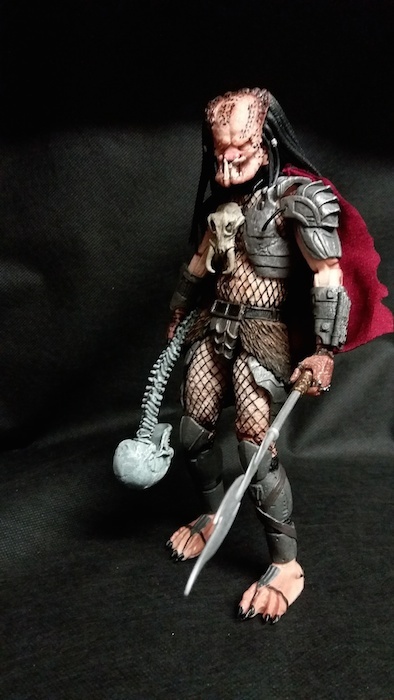 His head sculpt is very unique with his missing eye and mandible. 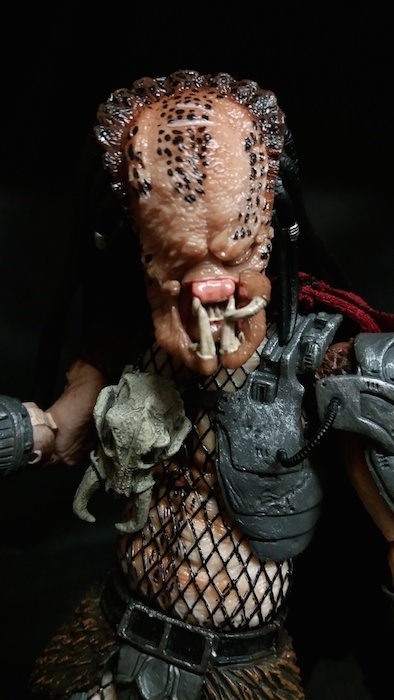 We haven’t got many predators with missing mandibles the most recognizable being Wolf Predator which NECA will release sometime next year. 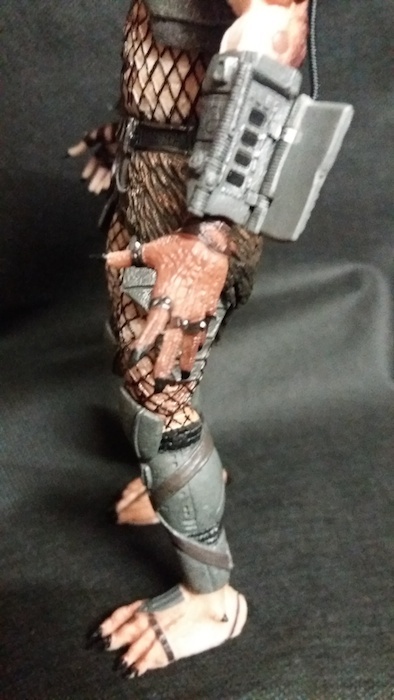 The accessories too are incredibly well detailed and he certainly comes with plenty of weapons to go on hunts. 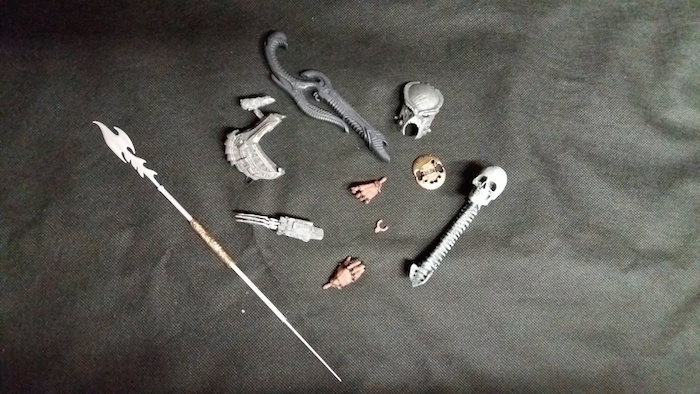 I especially love the Engineer gun which has a very H.R Giger look to it, I’ll go into more detail on this and his other awesome accessories later on. The paint job on Ahab is fantastic. I don’t see any bleeding or markings on the figure. 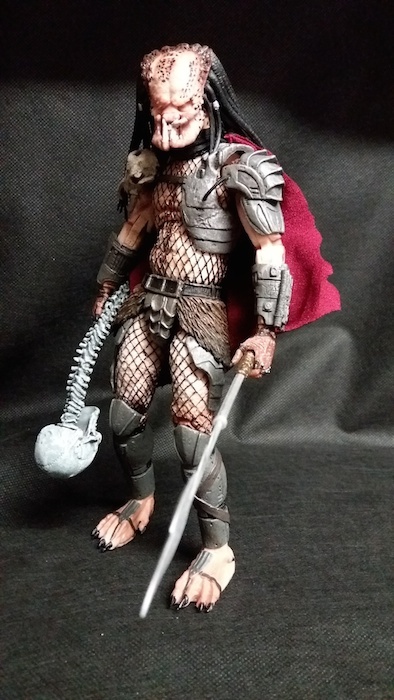 I really love the netting on this figure it looks really clean. 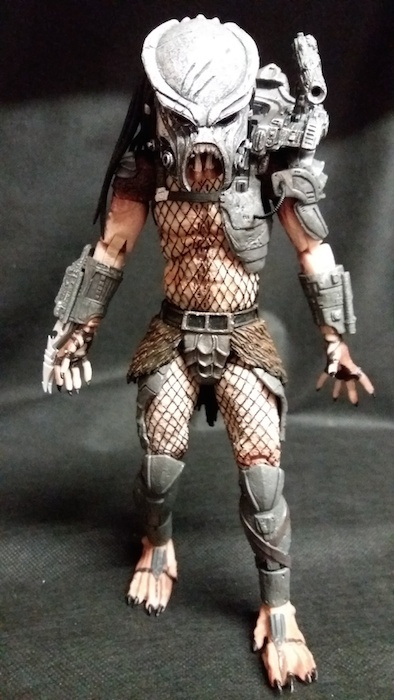 The paint washes in the armor really bring all out the incredible detail NECA have put into this predator. His skin pattern looks fantastic and I love the wet reptilian look to it. The paint on the head is simply incredible that’s for sure especially with how they’ve done the scars. They have been painted a slightly different color which gives the impression that he’s had them for a long time. 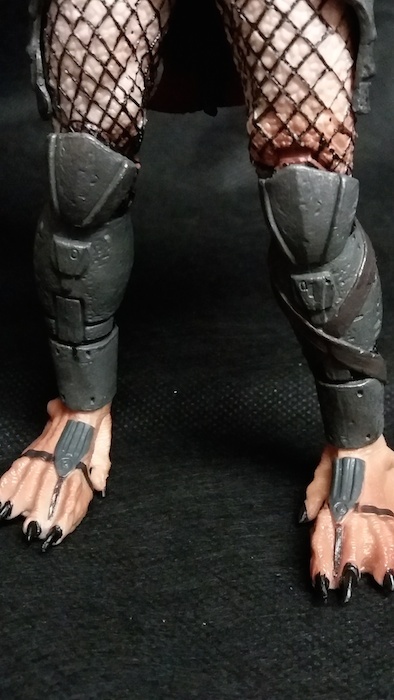 Unfortunately, the paint on my figure has caused some slight drawbacks with the articulation on my figure. The wrist computer on my Ahab was fused to the wrist gauntlet but thankfully I have freed it and now it works perfectly. Also as I was getting the articulation in the arms to work the two hoses snapped, unfortunately. They can easily be fixed in place using glue or just held in the right position. 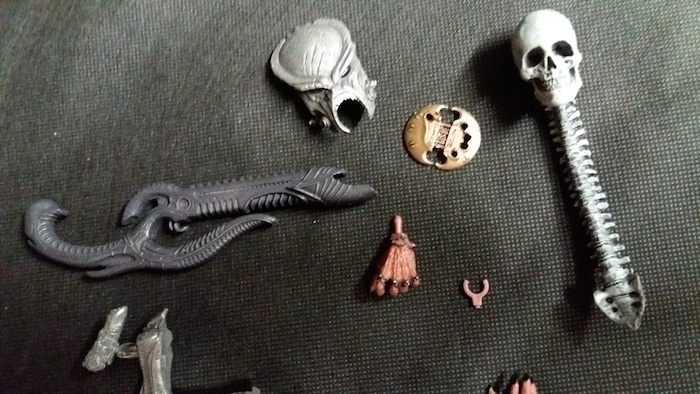 The accessories are painted incredibly well as well and I have no fault with these. They look outstanding and there’s no bleeding either. The paint washes on the trophy, smart disc, plasma caster, engineer gun, spear bio-mask, and the interchangeable gauntlet really sell the worn look to this figure. I’ve had no problem with any of the articulation and I didn’t run into any stiff joints aside the stuck wrist computer. Also, I broke the tubes on the shoulder and elbow whilst playing with the articulation though that can easily be fixed. He’s well balanced and holds many positions very well. I’m really impressed with the new articulation in the wrists in this ultimates figure, it’s something which I didn’t think was advertised before. 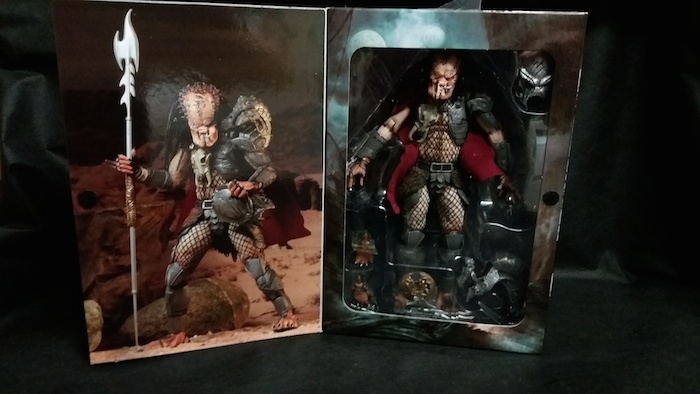 Though I know it was included in the awesome Kratos figure they released earlier this year. I have to say the new articulation works very well especially for holding the rifle and spear. 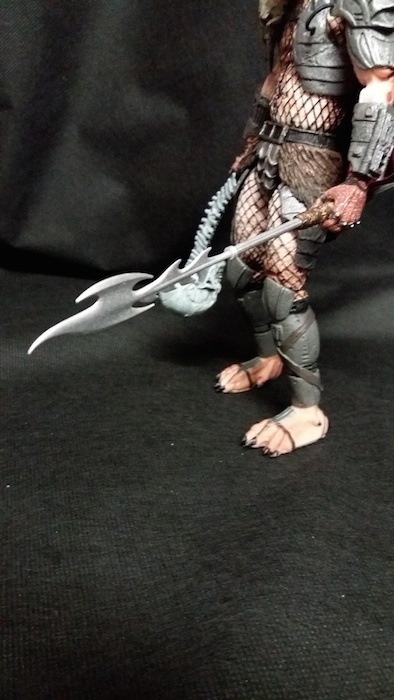 I wonder what other lines NECA will implement this articulation into in the near future. 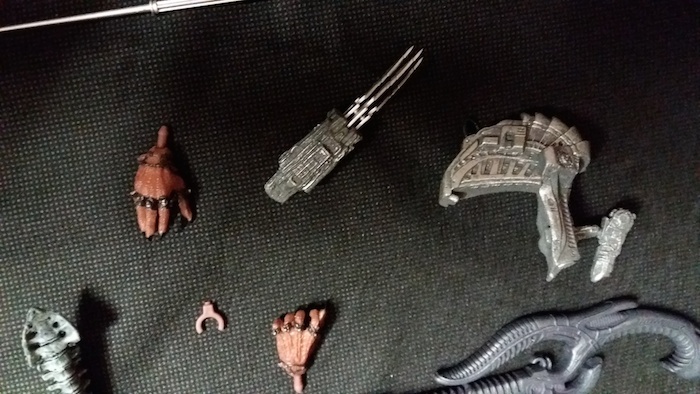 I was mightily impressed with all the accessories that Ahab came with. 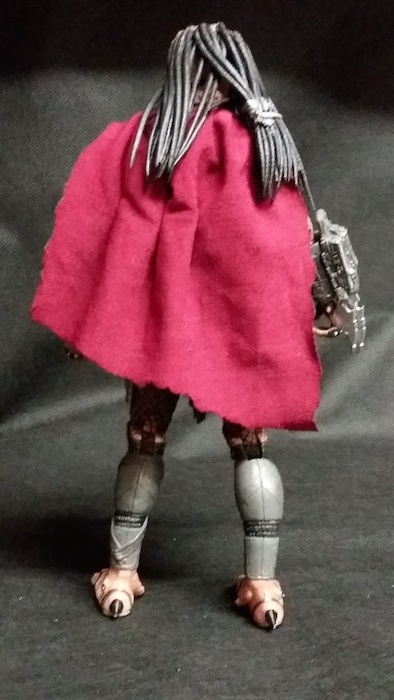 We don’t get all that many soft good products with NECA figures and I have to say Ahab’s cape came out very well, there’s a nice texture to it and it fits him naturally and doesn’t bunch up too much. 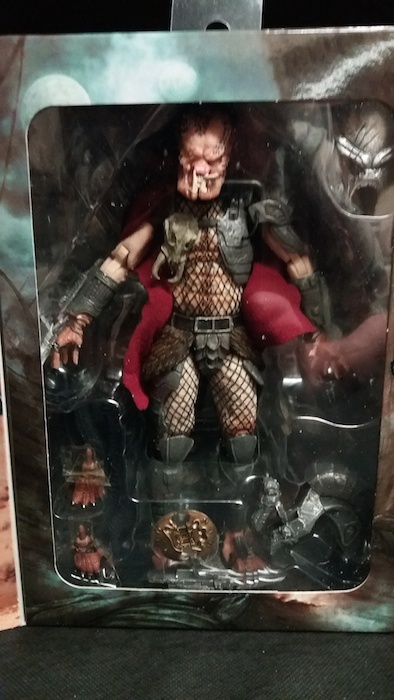 I didn’t expect the trophy around his neck to be removable but it is! 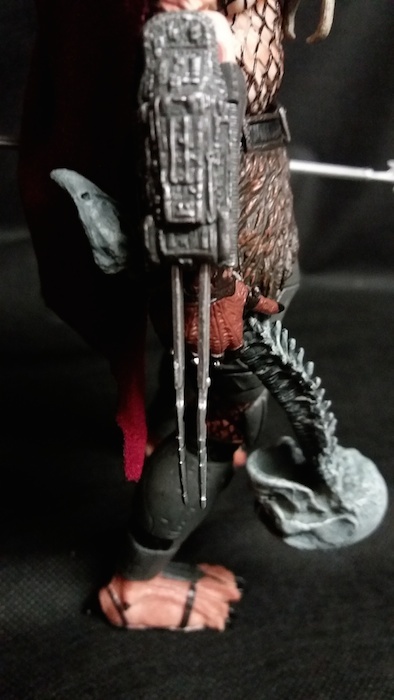 With these two removable accessories, you can give Ahab a number of looks as if he’s in battle, on the hunt or standing around looking ceremonial. 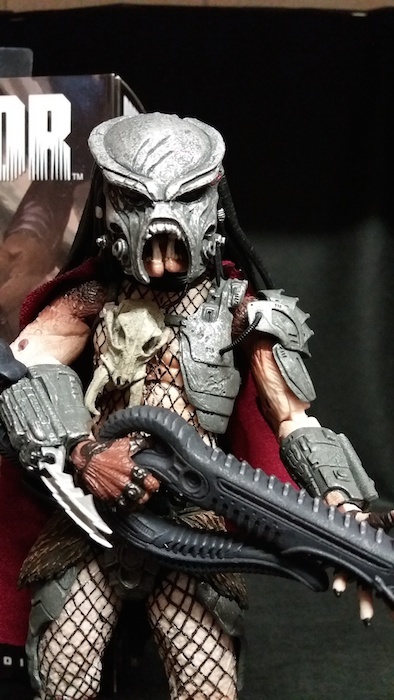 One of my favorite features of the predators are the bio masks I absolutely dig them as they add so much personality and character to them. 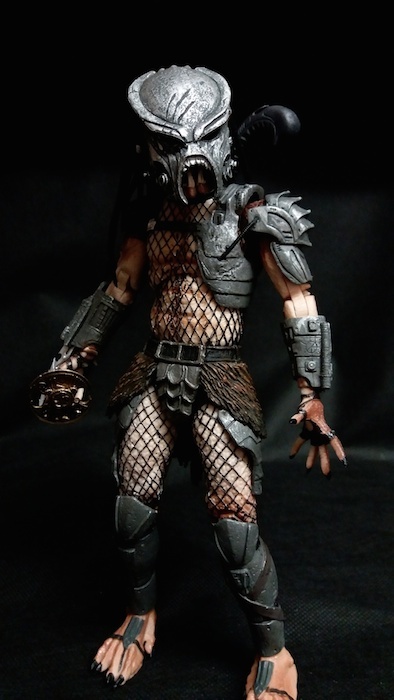 I have quite a number of Predator’s with bio masks and I have to say Ahab’s one of my favorite. I love the scars on the mask which replicates the scar on his actual face. 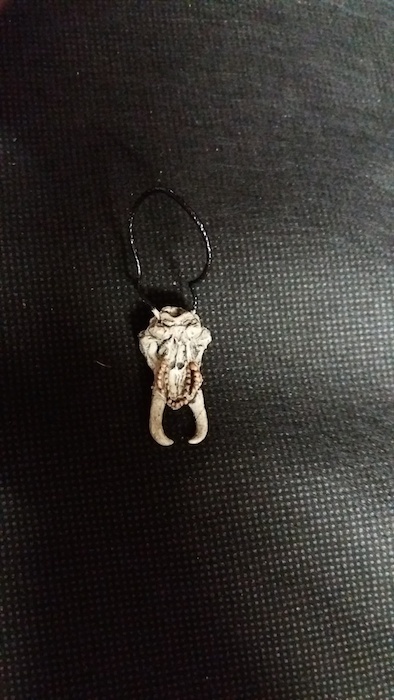 I suppose Ahab added these himself to show to his status and reputation as a hunter. The paint work on it is terrific and the sculpt is incredible as well. It fits very snugly over his face, though it can be rather hard to put it on at first. 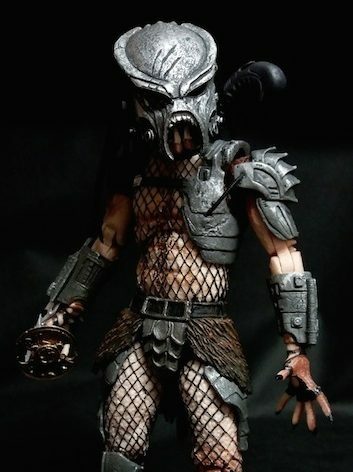 I’ve never seen a Predator with a three blade wrist gauntlet before and I have to say it looks badass! All the blades are connected together so you haven’t got to worry about losing them. The three blade gauntlet is noticeably bigger than the two blades one. To interchange them all you have to do is gently pull the top of the gauntlet out and peg the new one in. 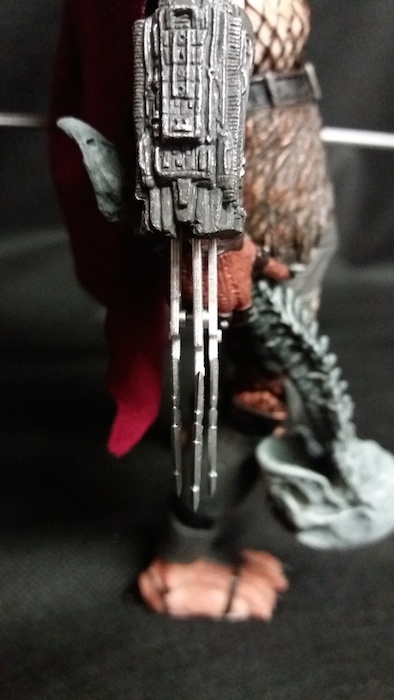 The open wrist blade is fantastic and it’s the first time that I’ve seen it in the line. I do have to say it’s a bit tricky to get him to hold it in his hand which is allocated to hold it. 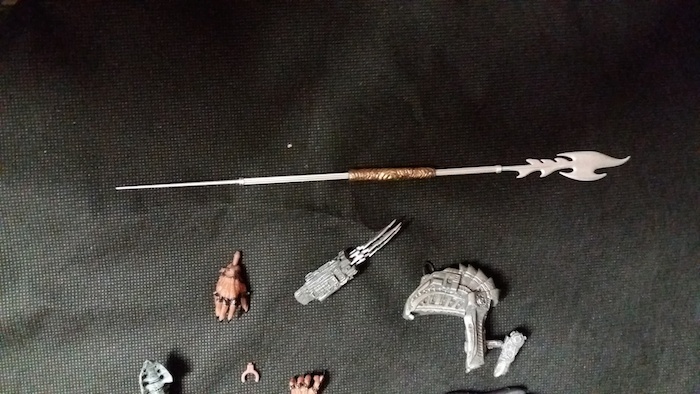 I really love the spear it looks fantastic and wholly unique with the nautical looking blade at the tip. 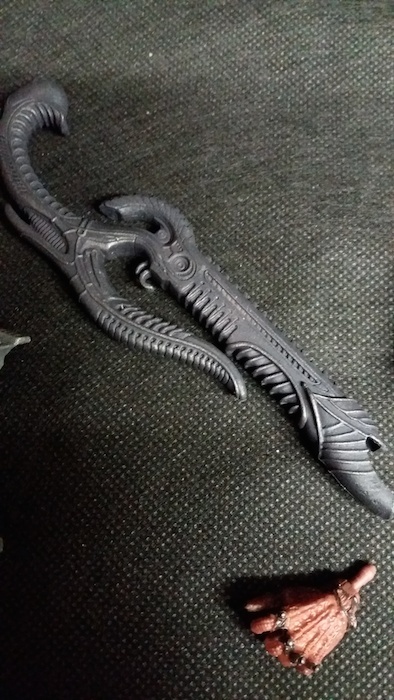 The sculpt gives the impression that in the comics that it can collapse if you look closely below the blade and the spear tip at the bottom. He can hold it very well in both gripping hands but it’s a better fit in the left. We’ve seen the Jungle hunter plasmas caster many many times in the line since the beginning and after all this time it still looks great. It’s a bit of a struggle to get it pegged into his back though with the cape on or off. 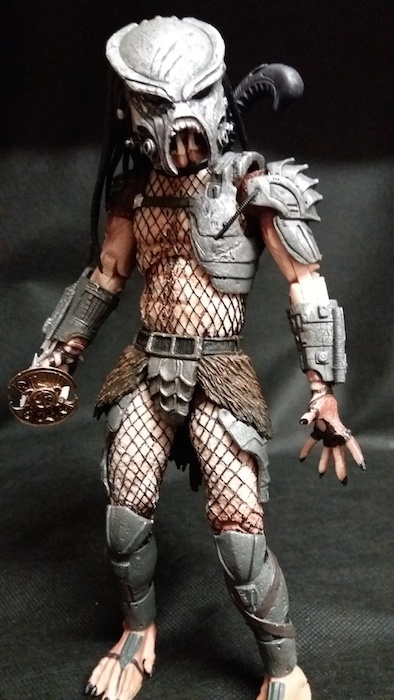 It’s always great when NECA release a Predator with a trophy, and I have to say Ahab has the king of all trophies! 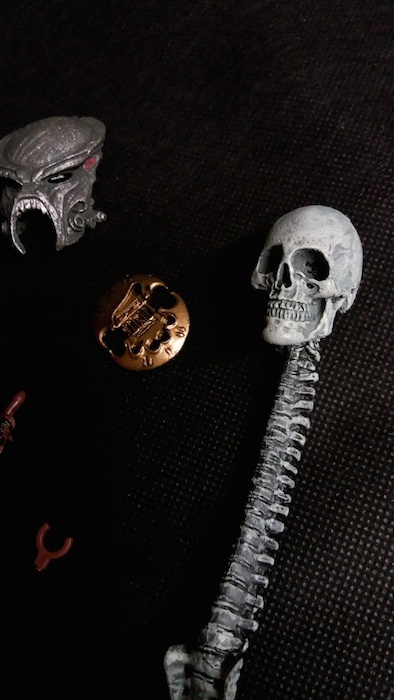 He comes with an engineer skull and spine which is absolutely huge! 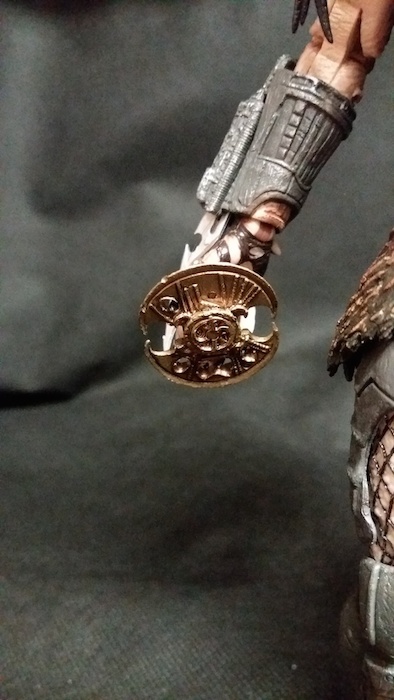 There’s a great weight to it and the sculpt and paint is done very well and it fits in the gripping hands as well. 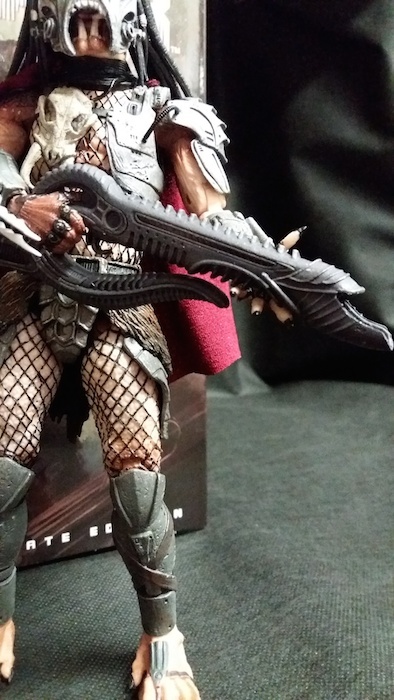 It’s definitely going on display when I put Ahab Predator. 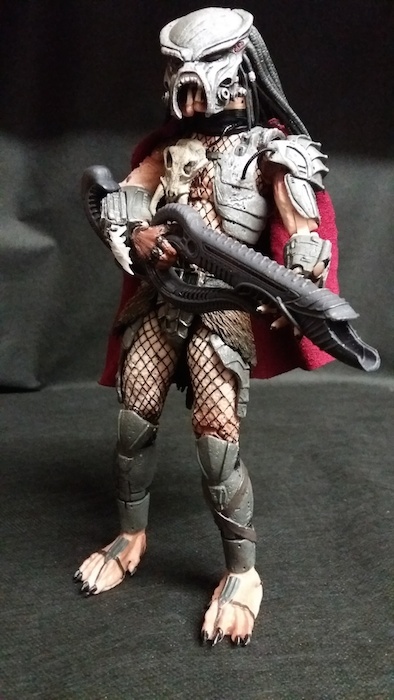 One of my biggest draws to this figure when NECA first announced this figure last year was the engineer rifle. 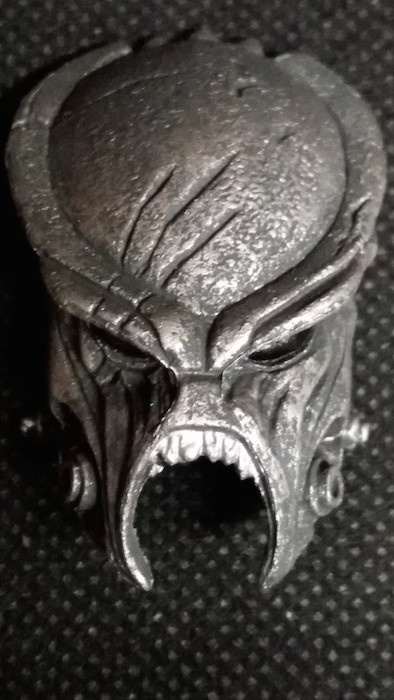 The sculpt is fantastic and very much inspired by H.R Giger with its shape and detailing. It’s a really unique looking weapon. 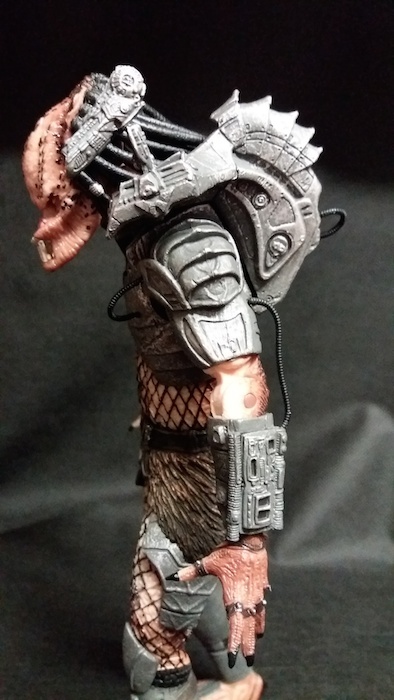 I should also add that NECA included a clip so that you can store it on his back which is a fantastic added touch. Ahab looks great holding it in one handed and two handed poses and with the swivels in the biceps making it look more natural. 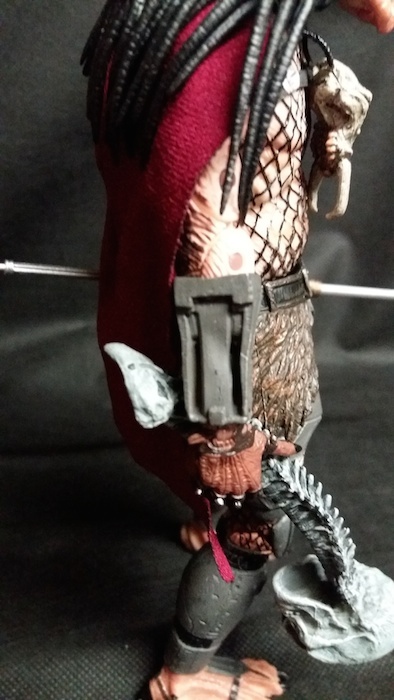 Ahab also comes with interchangeable gripping hands to hold his assorted accessories. 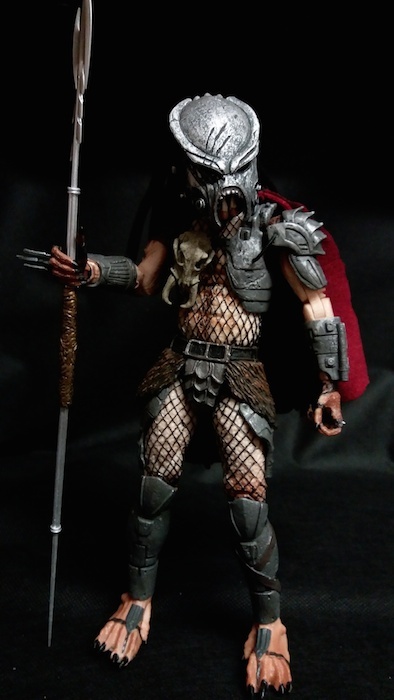 Despite the issues I’ve had with the tubes and the wrist computer I have to say this is an absolutely fantastic Ultimate Predator. The paint and sculpt are second to none and the articulation is great as well. He comes with a wealth of accessories and he looks amazing on display. I haven’t read the comics that he’s appeared in yet, but I certainly will now! 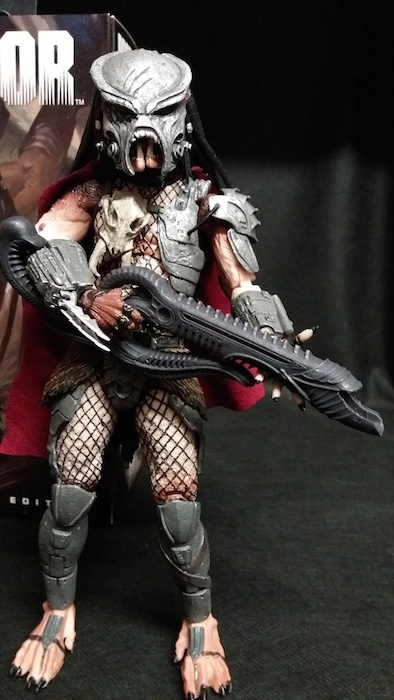 Ahab is a must have for your collection if you’re a fan of NECA’s Predators and you missed out on the original release and/or if you’re a fan of the comic book predators!